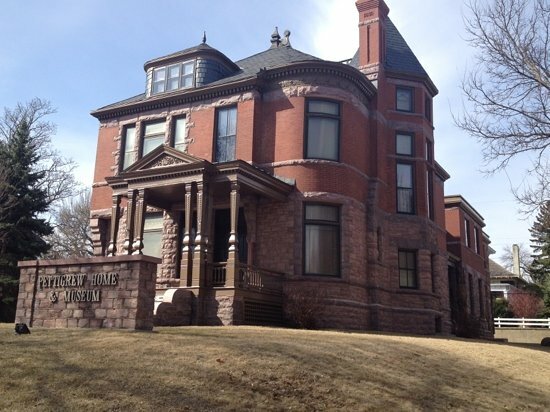 The beautiful old Victorian home in Sioux Falls, South Dakota was originally built in 1889 for Thomas and Jennie McMartin. 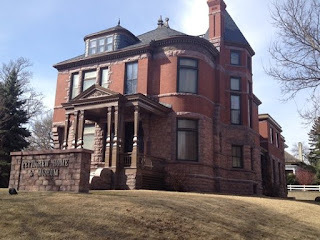 However, it would become known as the Pettigrew House in 1911 when Senator Richard Franklin Pettigrew returned to South Dakota and purchased the home. Pettigrew, who was born in Vermont and moved to Wisconsin with his parents in his youth, finally settled in what was then the Dakota Territory. When South Dakota was admitted as a state, Pettigrew became its first U.S. Senator. He served from November 2, 1889 to March 4, 1901. After briefly moving to New York to practice law, Pettigrew made his way back to Sioux Falls and purchased the McMartin home. Pettigrew was somewhat of an amateur archaeologist and collector. In 1925, he chose to display his collection of Native American artifacts, natural history specimens, and memorabilia related to the early days of Sioux Falls in his own little museum in the back of the home. Pettigrew would pass away a short time later, on October 5, 1926. While playing cards with his wife in his upstairs study, Pettigrew suffered a stroke. He died a few days later in his bedroom. However, his legacy and dream would live on. Pettigrew left his home and his collection to the city of Sioux Falls under the condition that the museum be maintained. Presumably, this was the occur AFTER his wife passed away or remarried, because she was still listed as living in the home at 131 N. Duluth Avenue in 1929 and other sources say the museum wasn't opened to the public until 1930. Whenever it actually opened, the museum has stood the test of time and is STILL in operation today! As the collection grew, an addition had to be built in the 1930s, but visitors today can visit the Pettigrew House Museum FOR FREE and view the original collection, as well as more recent acquisitions. The house itself is part of the museum, being set up with period appropriate furnishings to show how a man of Pettigrew's social standing would have lived during that time period. If one is REALLY lucky, one might also encounter a ghost among its halls! During a 2012 radio interview on local hauntings, manager Kevin Gansz discussed the hauntings, saying that the second floor of the old Victorian mansion was known for its darker, heavier mood. The mansion is also known for possibly three different ghostly inhabitants, one of who is believed to be Pettigrew's second wife, Roberta. While working in Mrs. Pettigrew's room, Gansz experienced a phantom scent of heavy perfume, believed to have been a sign of Mrs. Pettigrew. Mrs. Jennie McMartin, who passed away in 1908, is also believed to still be in the home. According to The Apparition Atlas by Daniel Diehl, Jennie has been seen wandering about the house, inspecting it to ensure that her home is kept in good order. The third apparition, which is mentioned in the book, appears to be a little girl wearing a white dress who appears on the staircase landing. Some her have seen her claim that she has blood on her face. Research into the house's history done by Kevin Gansz indicate that the McMartin family did lose a child while living in the home, which may account for those sightings. 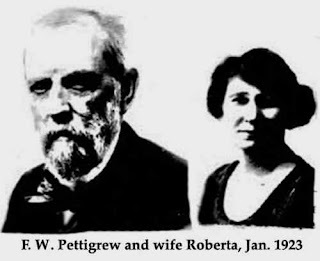 And, according to research I found on Find-a-Grave, Mr. Pettigrew had a maiden sister who lived in the home with the family and passed away there in October of 1922---could SHE be one of these female apparitions as well?